When you think of zombies, if you do, you probably envision the movie Night of the Living Dead, with its decomposing bodies escaping from their tombs to march though the darkness in slow, unstoppable formations eager to capture the living. But, not surprisingly, this is a Hollywood image that bears little resemblance to a more frightening reality. Brian Riggs may not be a real zombi, but after a month excavating in Haiti, he looked like one. Zombies really exist. To find them you must travel to the western third of the island of Hispaniola. Here, you will find the country of Haiti. The first free black (Afro-Caribbean) republic in the world. A country that won its independence from France, then the most powerful country in Europe, by defeating Napoleon’s Army in 1804. So while other West Indian nations were evolving under the careful eye of European land owners, Haiti pursued its own path. And having achieved independence at such an early date, Haiti has invented a culture that is unique in the world. A culture built through the syncretism of various African beliefs in conjunction with Native West Indian Taino and European influences. An all encompassing element of the culture is religion. Usually spelled “Voodoo” (though the actual pronunciation is closer to vodoun) these are actually the ceremonies in which practitioners are possessed by the loa, the spirits. As in all religions there exists a tension between good and evil. Most vodoun has little to do with sorcery and black magic. Zombies, however, are one of the exceptions. The word ZOMBI probably comes from the Kongo word nzambi, which glosses as “spirit of a dead person.” In Haiti a zombi is someone who has annoyed his or her family and community to the degree that they can no longer stand to live with this person. They respond by hiring a Bokor, a vodoun priest who practices black magic and sorcery, to turn them into a zombi. Through the application of a coup poudre (magic powder) the victim appears to die. They are then buried and within a few days are exhumed. Though still living, they remain under the Bokor’s power until the Bokor dies. In April 1982, noted ethnobiologist E. Wade Davis went to Haiti following reports that two people who were supposed be dead had recently returned to their villages. Both the victims and their relatives attested to the fact that these two had been turned into zombies. Fortunately for Dr. Davis, one of the victims was able to describe the symptoms that followed his poisoning. Davis succeeded in learning the recipe for poudre zombi, and was present to witness its preparation. In the process, he recognized that the main ingredients included fou-fou which we know as the porcupinefish (Diodon hystrix), and the crapaud de mer, sea toad or pufferfish (Sphoeroides testudineus). Fishes that contain a deadly nerve toxin, called tetrodotoxin. 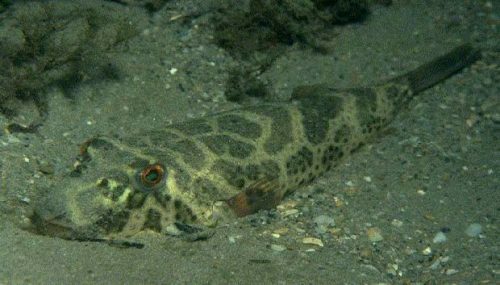 The symptoms of puffer poisoning have been described by Dr. Bruce W. Halstead as follows: “Symptoms of tingling about the lips and tongue and motor incoordination usually develop within 10-45 minutes after ingestion of the fish. The tingling may later spread to other parts of the body. In some instances, the numbness may involve the entire body, in which instances the victim may feel as though he were ‘floating’. Excessive salivation, extreme weakness, nausea, vomiting, diarrhea, abdominal pain may soon follow. Twitching of the muscles, paralysis, difficulty in swallowing, loss of voice, convulsions, and death by respiratory paralysis may ensue. More than 60 percent of the victims poisoned by this fish die. 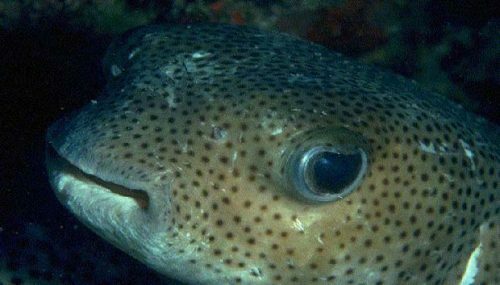 There is no specific treatment or antidote for puffer poisoning.” (From: Dangerous Marine Animals by Bruce W. Halstead, Cornell Maritime Press, Cambridge, MD, 1959). Although these fishes are highly toxic, they are regarded around the world as a delicacy. The Japanese have a passion for fugu fish (puffers in the genus Fugu), and the Chefs who prepare the fish are required to obtain special government licenses. Despite precautions, hundreds of deaths from fugu fish poisoning occur in Japan each year. As an aside, fugu poisoning was the murder weapon in Jane Haddam’s book Murder Superior (Bantam Books, NY, 1993). It was also used to poison James Bond at the end of From Russia with Love by Ian Fleming (Berkley Books, NY, 1982). Having conducted archaeological research in the West Indies for the past 20 years, I was always curious about the substantial number of pufferfish and porcupinefish that we we recover from archaeological sites. Initially I simply assumed that the Taino Indians who lived in these islands had found ways to prepare the fish to avoid being poisoned. After all, their staple crop was manioc (Manihot esculenta), a root whose “bitter’ varieties contain toxic levels of cyanogenic glucosides (prussic acid). The poison must be removed by grating the tubers and squeezing out the juice before the flour can be eaten. If they had learned to remove one poison, they certainly could learn to remove others. Then something happened to make me wonder if these fish were not being used in other ways as well. Betsy Carlson identified the huge upper jaw of a porcupinefish (Diodon sp.) in a faunal sample from the MC-32 site on Middle Caicos. This jaw had come from a fish that would have been over 2 feet long, which is about maximum size for a porcupinefish. The jaw was put on display in a small exhibit of Taino artifacts in the Turks and Caicos National Museum on Grand Turk. By chance it was juxtaposed to a display of pottery from archaeological sites in the Turks and Caicos. One of the larger pieces, about one-third of a bowl, was shaped like an animal. Originally, I thought the animal was a frog, because frogs figure prominently in Taino mythology. But on closer inspection, and comparison to published photographs of pufferfish, I became convinced that the bowl was shaped to look like a puffer. Compare the photographs of the fish and the pot. Notice how both have a bulbous body, both have raised eyes, both have an elongated mouth, and both have nose holes — though the holes in the pot have been relocated to above the eyes where they served to accomodate strings by which the pot was suspended. It is striking how alike the two images appear. The archaeology of the site is described in detail elsewhere (GT-2). It should be noted that the bowl was brought to Grand Turk from Haiti around AD 1200. It was found in association with a variety of ritual paraphernalia in a place where they were making disc-shaped beads which were woven into belts to record alliances between caciciques (chiefs). The value of the beads derived from their brilliant red color and that they came to Haiti from across the sea. Given the historical context in which this porcupinefish effigy bowl was recovered one is left wondering whether the Tainos used the tetrodotoxins in these fishes as a means to communicate with the spirits, and to heighten the authority of the behique who could seemingly die and then days later appear to rise from the dead. In other words, were their zombies in Haiti before there was Vodoun? These musings would not have been possible without Betsy Carlson’s analysis of fishbones from archaeological sites in the Turks and Caicos. Other pieces of the puzzle came from The Serpent and the Rainbow by Wade Davis (Simon & Schuster, NY, 1985). Brian Riggs was a good sport to let me use his photo. Lastly, months spent at Cormier Plage, Haiti, over the past several years have made me more sensitive to the supernatural. Photographs are copyrighted by the photographers and may not be reproduced without their expressed permission. To copy fish photographs contact David B. Snyder at csa@gate.net. For others contact William F. Keegan at keegan@flmnh.ufl.edu.